An Exploratory Trip With Eric Oster and Steve Call. There were many memorable moments on Moose creek. Some were pleasant moments. But many were difficult and those memories remain a bit raw. The pleasant memories are of Eric & Steve, the companions who shared the struggle to make the first descent of Moose Creek with Oliver Merrill and I. Another pleasant memory was on completion of the creek descent there was a wonderful round of toasts during dinner at a fine lakeside camp. The hours when we were living close to the “edge” are still vivid. Some portions of the trip were simply uncomfortable but the “nail biter” periods portaging and lining rapids stand out. 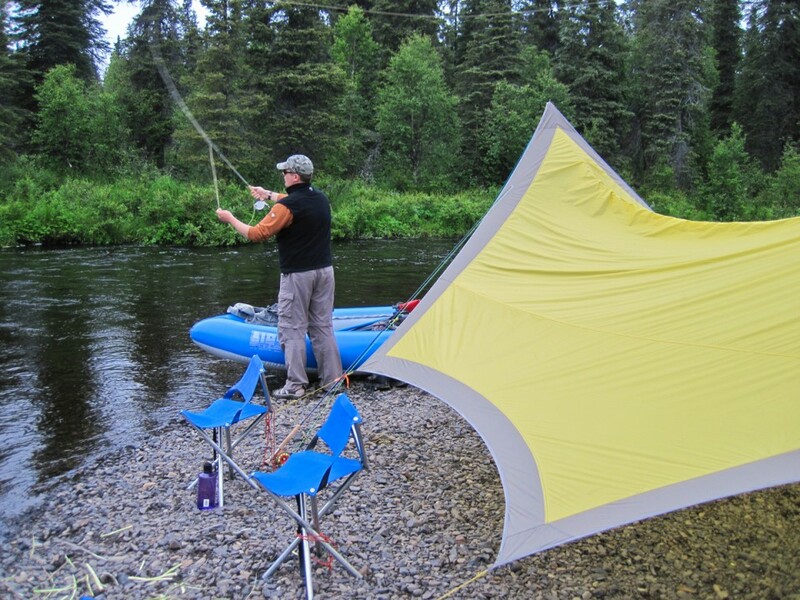 The background to the Moose Creek trip is that I’ve found some worthwhile, even extraordinary Rainbow Trout fishing on minor tributaries of the Nushagak, King Salmon, Togiak, Goodnews, and other Bristol Bay rivers. This one, Moose Creek has some of the quality of the extraordinary ones and might be navigable for very small rafts. So it intrigued me as an adventure and as a fishery. What I knew verifiably is that large Rainbow Trout spawn in Moose Creek in May and June and that it looked from the air to have the right habitat and water quality to support a resident trout fishery. Furthermore I know that the Moose fishes well for Trout and Char by walking up it from Lake Beverly at certain times of the year. So I carved out a week, proposed the exploration to two very adventuresome anglers, and together we outfitted a small expedition to explore the creek from top down. The trip planning paid off but not with the “Old Growth Rainbows” that we sought. It paid off because we were traveling light and with just the right gear so when we did encounter the unknown challenges that lay before us, we were prepared. The excitement built for the trip over the winter of 2012 as I researched the Moose. A list of the variables that goes into my matrix to decide if a remote waterway is worth the effort and expense to explore follows. The variables are: Presence of salmon and salmon spawning habitat? Yes check- that variable. Sockeye are known to spawn in the Moose. Presence of Rainbow Trout or Char? Yes -check- that variable. 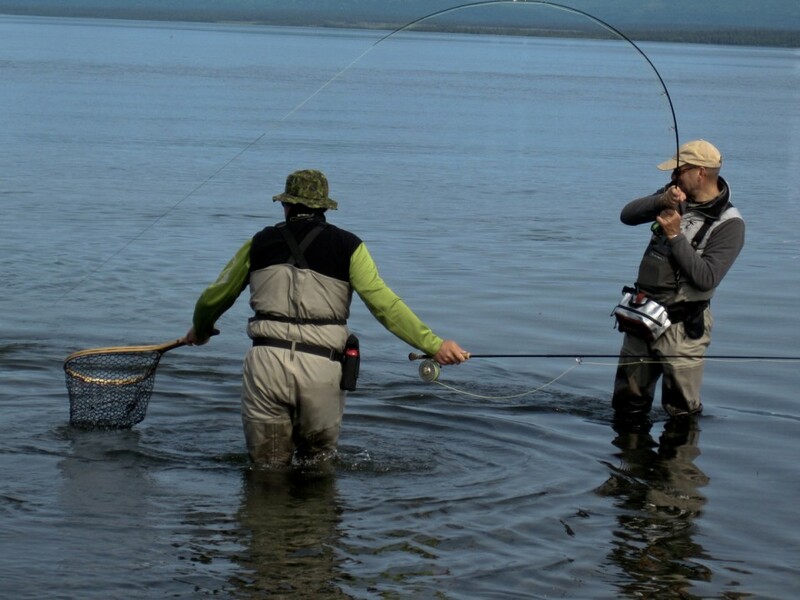 The Alaska Department of Fish and Game ran a weir on the lower creek and extensively documented adult Rainbow spawning presence. Water quality? Yes–check- that variable. 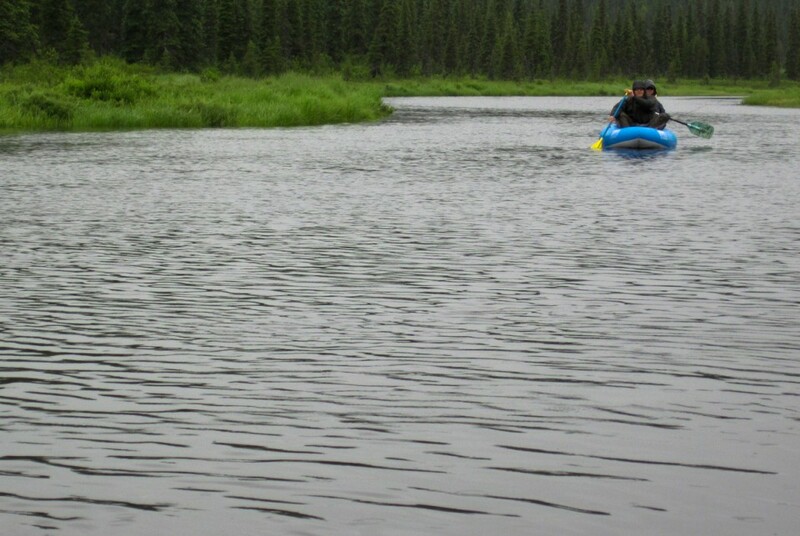 The creek headwaters are 3 lakes supplying clear cool water plus a world-class fishery supports trout in Lake Beverly at the terminus of Moose creek. Creek Gradient? -check- that variable. Gradient is about 150 feet in 15 river miles so –check- yes the possibility for whitewater. Variable-log jams and sweepers, -check- “unknown”. We’d have to scout ahead. Sufficient water depth for conventional rafts, versus pack rafts, -check- “unknown.” Enough time available for worst-case logistics (portaging and dragging rafts)? Yes -check- that variable. We had 7 days to cover 15 miles. Mosquitoes, -check- that. We each had head nets and Deet. First Aid and Trauma. -Check. We carried an EMT trauma kit with drugs. Float plan. -Check. 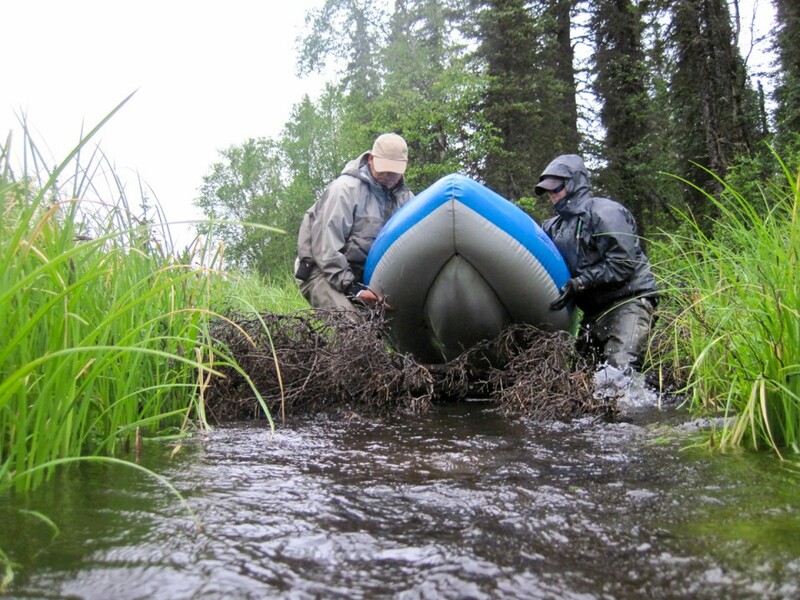 We’d filed a float plan with our pilot who’d pick us up on Lake Beverly at the Agulukpak River. Emergency communication. -Check. We carried 2 Satellite telephones. It seemed likely we’d find a few big trout and char that have been undisturbed for most of their lives. We assumed we’d suffer while dragging boats down creek water, which would be too skinny for paddling. What actually happened: From the log of July 14- July 20, 2012. Day 1: The “flight in by float plane was ‘workable’, although visibility in rain was not great. It had been raining for the prior week. We flew north from Dillingham to Lake Beverly and up Moose Creek looking down at the creek and at the headwater lakes. 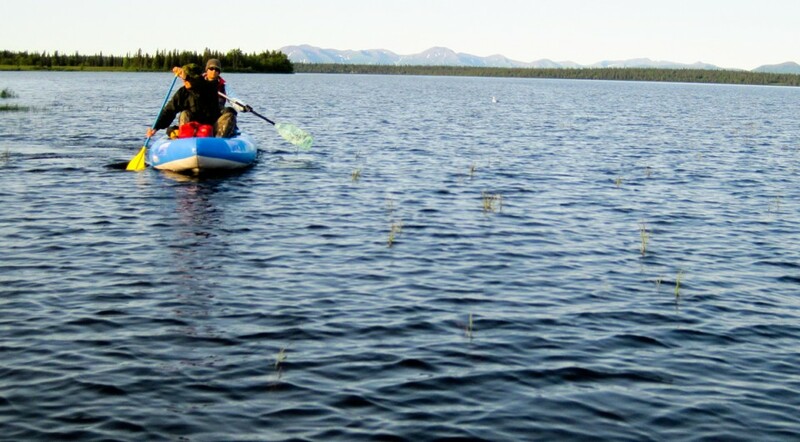 We landed on the lake with an outlet stream which looked as if we might drag the rafts to Moose Creek.” We’d chosen Aire Traveler rafts, which are very narrow, only 47 inches wide. 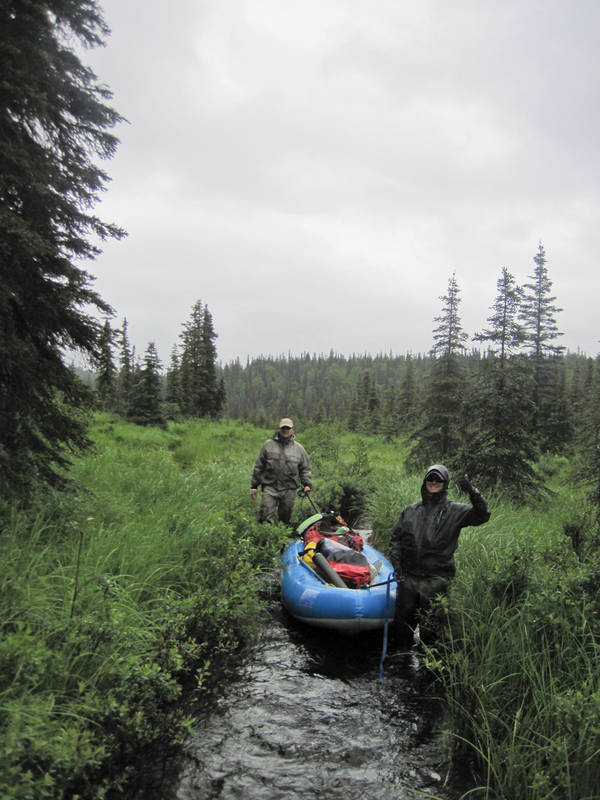 We dragged and lined down 1.2 miles to the confluence with Moose creek and then floated. We were very happy with the narrow boats. It would have been heinous if we’d chosen to drag 56” wide X 14’ rafts with oar frames down the outlet creek. The water conditions as we found them were quite high but not flooding and after day two would slowly fall. The water color was tannic but clear. Small Grayling were rising to Mayflies on Moose creek in the rain in the late afternoon as we scouted for a camp. While scouting for the first camp I found the bony remains of a Sockeye Salmon from last year’s spawn and thought that was auspicous for Rainbows. 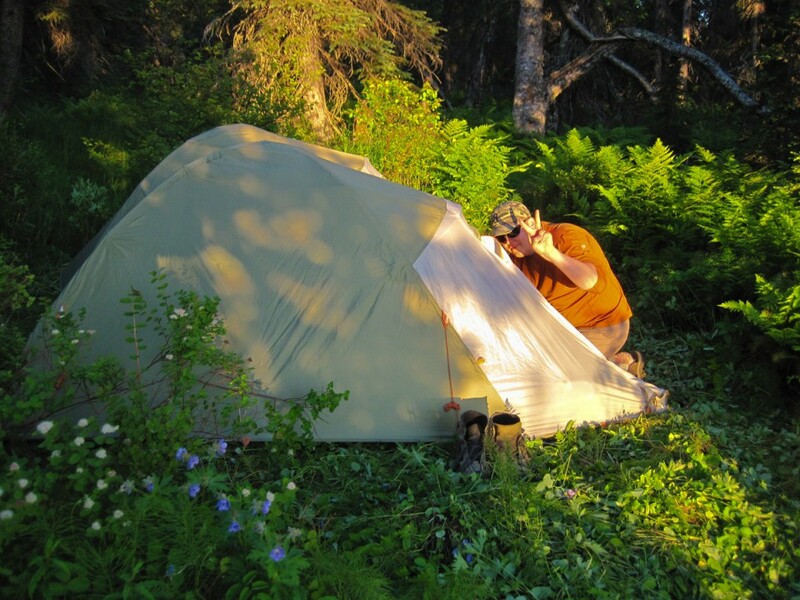 Each camp would turn out to be a unique challenge to find and create but on that night, 4 miles from where the plane had dropped us, we found level ground in a moose meadow and were happy for it. Our thoughts turned to Steve’s son, just deployed to Afghanistan. We were safe in the Moose Creek wilderness tonight, was he safe? Granite boulders the size of Volkswagen Beetles choked the creek channel between bed rock bluffs for ½ mile. Nowhere was there passage for our small rafts for more than a few dozen yards. There was not enough distance between rocks to maneuver. Had this been a sunny afternoon along a road system and we had empty rafts it would have been a good stretch to “play in”, where the prospect of a swim could be managed. This modest class II+ III- rapid was going to cause us harm if we ran it with loaded boats, I felt sure. This small gorge was an unwelcome sight. We scouted a portage traversing a “brushy hillside with some epic tussocks, a scattering of snarly white spruce roots and logs to trip over, dwarf birch and blueberry bushes to bash through, then an authentic sphagnum bog. 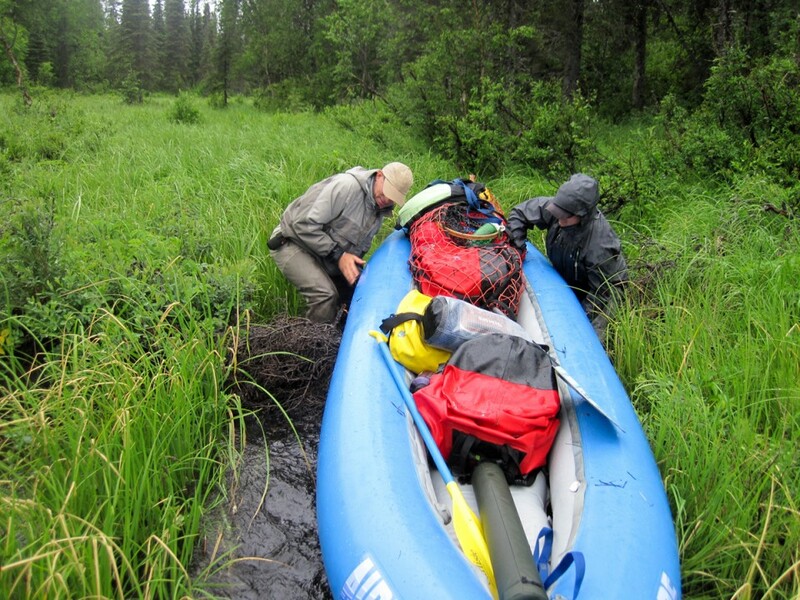 The black gnats were intense.” Olly was route finder and Eric was point man as we dragged the rafts across the portage. Eric took the lead role and had the persistence and muscle to bull his way through. Steve and I scrambled along tugging and lurching forward. There was nothing else to do but put one’s head down and pull. When that was over we returned for the river packs. We began the portage at noon and finished at 5:30 then proceeded to line the boats down minor rapids and paddled some small pools. The log entry ended: “Tough day. Everyone tired. Camped at 7:00 pm. A moose ran past camp, crossing the river around 11:00pm with hooves crashing and gravel scattering.” We travelled 4 miles. On day three as we broke camp we could hear Sandhill Cranes yodeling as they flew up the valley. Immediately below camp we entered a braided section of the creek with lots of log sweepers, which made channel selection problematic. Around each corner lay the unknown. There was only one safe option that day. To walk ahead and scout all the sweepers and log jams, pick the safest route and then return. Carefully we let the boats down through sweepers using long lines and coordinated efforts between team members, Boats were lifted and shoved, dragged and lined. The granite bluff features we’d had such a struggle portaging around yesterday were less dramatic and the rocky reaches more manageable. We noticed the bluffs were shale in this area and didn’t spawn the large boulders that the harder granite bedrock presented yesterday. With each obstacle behind us we made slow headway toward the lower creek and the gradient diminished by the hour so the likelihood of another unknown groge decreased. Still there was no rest. Around the next bend lay more challenges. The fishing in the middle reach can be summed in a phrase. It did not fish. The water was high, waist to chest deep in pools that in mid summer would normally be knee to thigh deep. The flow was strong so there were problems getting flies to depth. Still Steve and Eric worked it with streamers and nymphs and had no encounters with trout. A few diminutive Grayling were taken. We collected no data just the absence of data. The travel logistics were tough and the fishing took back seat. From the log of July 11, 2012. “We made camp in the lower creek after a long day of good weather lining the boats down the creek. Very tough lining and no fishing could be accomplished as we moved.” By the end of day three it was clear we were not on the fishing trip we’d hoped for. We could not know that for the first couple days, even after the portage and lining because there were miles ahead for the character of the creek to change favorably. But we gradually realized that the fishery was not significant, that it was marginal and we simply needed to put Moose Creek safely behind us. Eric released a couple 8” Grayling at camp as we relaxed that night. A young blond Brown Bear approached camp in the “head down- eyes focused on the water” manner that signifies a bear fishing intently for salmon. She was blond and narrow through the shoulders and retreated when we signaled our presence. Day 4: Our final day on Moose Creek. The creek bed character finaly changed for the better. It spread out and meandered more. It looked extremely appealing. Twice the creek came up hard up against minor rocky bluffs with small rapids. We could let down our guard a bit about potential obstacles and fish more. 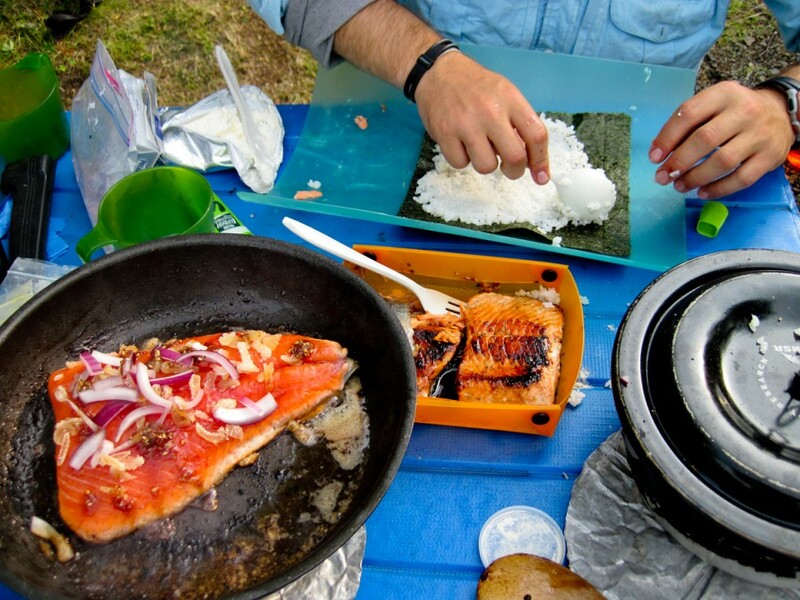 Sockeye salmon gradually became abundant. We slowed our pace to a fishing pace with the anglers ahead searching while Olly and I brought the boats down. 2 Rainbows, some Grayling and a Sockeye were caught and released. Moose Creek was now, indeed a trout stream for it’s last few miles before the confluence. We approached the confluence of Moose with Lake Beverly at 5:30 pm spotting a few large Arctic Char, in association with large numbers of Sockeye, but the Char could see us too and refused. We killed a Sockeye for dinner and paddled east and then south on Lake Beverly passing Spider Creek until we found a really fine camp on a breezy point. Certainly we’d hoped for better fishing on Moose Creek. 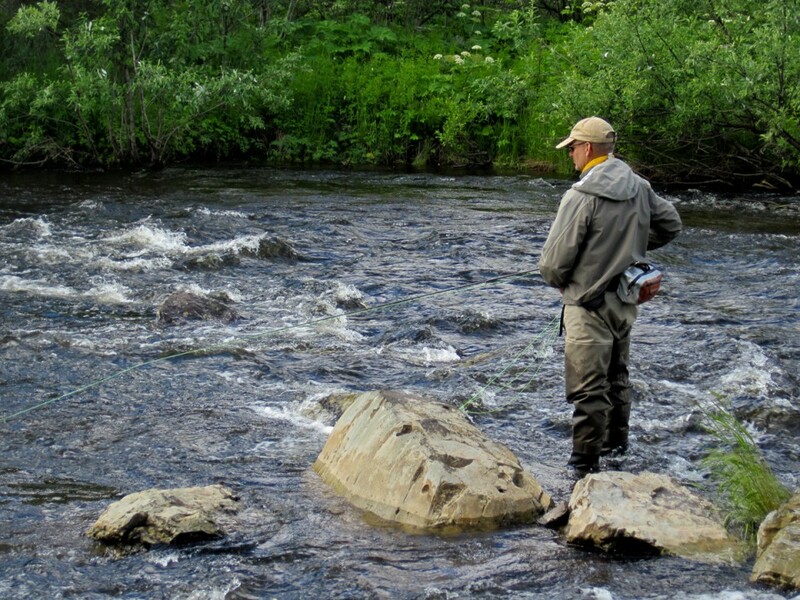 We’d dreamed of finding a kind of Bristol Bay “Grail”, an inaccessible rainbow trout stream where trout die of old age. We’ve found three of those grail streams in recent years but Moose Creek was not to be the grail. We’d imagined that with the right equipment and skill sets we’d be able to access the inaccessible. As it turned out it was a tough trip down a modest creek in conditions marginally favorable for even Grayling fishing. We drank a toast of an extraordinary Scotch that Eric Oster had provisioned. It was the Shackleton blend and that was appropriate and very fine as we rested after 4 days of portages and lining. 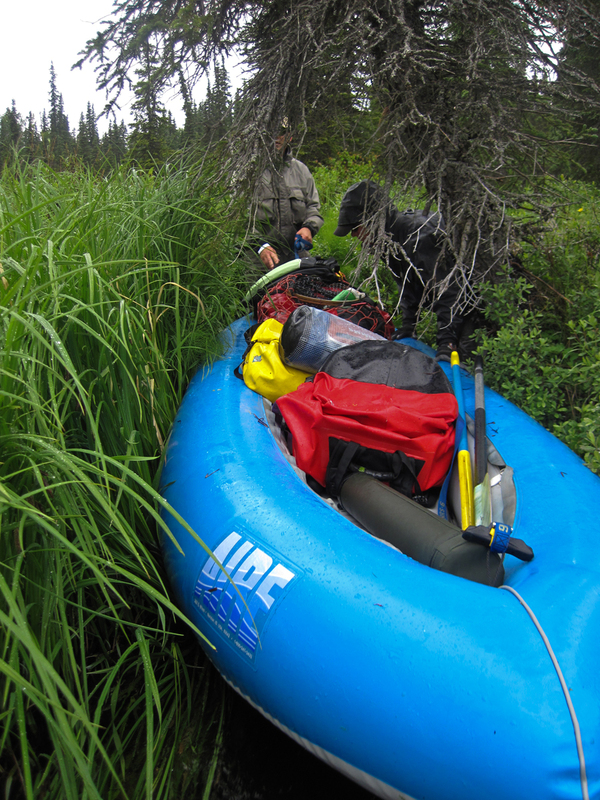 Epilog: We paddled down Lake Beverly and camped at the Agulukpak River. 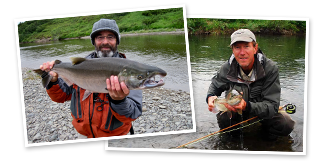 Steve and Eric took some very, very fine Arctic Char and Rainbows. Arctic Char when lightly steamed or pan-fried is a remarkably firm light pink flesh. We cooked sticky sushi rice and rolled Char & cream cheese with Nori seaweed sheets for Agulukpak sushi rolls. One tough trip through paradise ended in the fish rich fiord lakes of the Wood Tikchik State Park.